I have finally finished this cute little doll for my little girl. OK, OK, so she still needs clothes but it took me a year to get to this point! I'm cutting my losses and calling it good! She was actually mostly finished within a week of me purchasing the pattern from a very talented lady back when she was still "Bowl's n Annie's" I think I specifically bought the Cupcake Cutie pattern for it's smaller size. 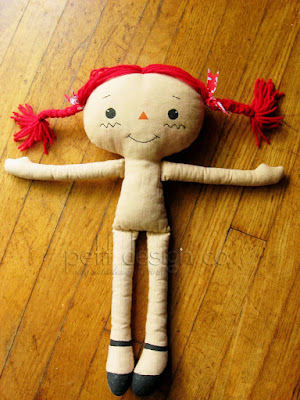 However I made this doll twice as big after the first one was gobbled up by the dog within a week of me finishing it! So if I confused you, the time line goes like this: I bought the pattern, then a week later I finished the cutest little doll with clothes and everything, a week after that my daughter left it outside in the back yard. A few days later I realize what all the "fluff" was outside :( We move to Alabama and then I decided to make another doll. My daughter steals said doll while she was mostly done (hair mostly done and clothes missing.) After a few months of playing with her the doll's leg seam burst open and so the dolly was placed in a box in my sewing room. We move to a different house and the doll resurfaces. My daughter once again steals the doll. Finally last week she brings me the doll and asks me to fix her "broken leg" I do her one better, I fix the leg and finish the hair. Isn't she cute? Maybe I'll get around to making her some clothes! I hope she'll survive for a long time because my track record is not very good for doll making!